If you’re running a plumbing company, one of your top concerns is how to more plumbing leads. Leads are the oxygen for service companies, and plumbers are no exception. Breathe or die, right? Well, let’s refill your oxygen tank with these 5 secrets for getting more plumbing leads from Google AdWords. The first step to success on AdWords is understanding where your ideal customer is coming from, and then targeting that person with your keywords and ads. Think about your average homeowner. Perhaps it’s 11:13PM on a freezing cold night and they discover that one of their pipes has burst and is flooding their basement. They jump on Google – what do they need? Immediate help. It’s an emergency. They don’t want to submit a lead form on your website and wait two days to hear back – they need someone to come to their house right now! You can target this customer by adding the keywords “emergency plumbing”, “plumbing after hours”, “emergency plumber near me”, etc. to an ad group in your AdWords campaign. Then, in your emergency plumbing ads, emphasize that you offer 24/7 service, and that you are the choice company for emergency situations. When your ideal customer sees that you offer exactly what they need, they will be quick to click on your ad and become a lead. When given the choice between a generic plumbing company ad and one that specifically emphasizes their capacity for emergency plumbing, you can bet which ad that customer will select. Be sure also to emphasize your emergency phone number on your website. What if your website isn’t quite up to par? Running a call only campaign can be an excellent way to get leads. Call Only campaigns are exclusively for mobile and cell phone searches, and when your call only ad shows up, your headline is simply your phone number. Thus, the customer doesn’t even need to go to your website – they can call you directly from the ad! Thus, you remove one step of the lead generation process – they don’t have to search in Google, see your ad, go to your website, and then decide whether or not to contact you. Instead, they search in Google, see your ad, and call you right from the ad, immediately becoming a lead. When someone is in an emergency situation, they probably aren’t in the mood to shop around and compare multiple different companies for the best deal. They just want to get their problem fixed ASAP. Thus, when you show up in the first or second position of search results in a call only campaign, they are ready to call you and get one of your reps headed to their house in a matter of minutes. These leads are easy pickings, so be sure to create a call only campaign and target emergency keywords. The difficulty and danger of advertising on Google is that while some people are looking for a company to fix the problem for them, others are do-it-yourself types of folk. And if you show up on DIY searches, those people will click on your ads (which spends your advertising budget), discover that you are a plumbing company rather than a DIY site, and leave. So in order to make sure you don’t spend your budget on searches like “fix a broken pipe DIY” or “plunger for clogged toilet”, it’s important to block those search terms. Fortunately, that’s easy to do! Make a list of all the search terms you definitely DON’T want to advertise for. That might include searches like “fix a broken pipe DIY”, “plunger for clogged toilet”, “how to do plumbing for a bathroom”, etc. Then, isolate the problem keyword or words in that phrase. If you simply added the whole search phrase as a negative, then potentially “fix a broken pipe DIY” would be blocked but “DIY fix a broken pipe” would not be. To block ANY search, ever, that includes the word “DIY”, you just want to block the word “DIY”. “How to” and “plunger” would be good terms to add as negatives from these examples as well. Here’s a bonus secret: also block spelling variations of the keywords you block! Lots of people misspell “DIY” as “DYI”. You will want to be sure to block both. The end result? You will show up on fewer junk searches and more high-quality ones. Searches represent prospective leads, so the more good searches you show up for, and the more bad searches you block, the more leads you will gain! Relevance is key when you are advertising on Google Search. When someone searches “commercial plumbing services”, for example, they would rather click on an ad that talks about specifically commercial plumbing rather over a generic, catch-all ad about local plumbing. Why? Clearly, they feel that the business that addressed their specific concern understands them and their needs. There is an immediate sense of trust. When you can demonstrate, with your ads, that you understand exactly what they need and offer the solution to the problem that they have, your leads will skyrocket. So, how do you set up your AdWords campaign to show specific ads to specific kinds of searches? When you structure your ad campaign, you are allowed to sort your keywords into different ad groups, and each ad group will only show its ads for the keywords in that ad group. So, if you have a “commercial” plumbing ad group, you would put only commercial keywords in that ad group to target in Google Search. Then, you would write ads specifically for “commercial plumbing” for that ad group. The same goes for any type of service that you offer. Do you offer remodeling plumbing services? Set up a specific ad group targeting “remodeling” keywords and write remodeling ads. Do you offer bathroom and kitchen renovations? Target “renovations” keywords in your “renovations” ad group and write matching ads. Do you provide emergency plumbing services? Make that service its own ad group and write specific ads just for emergency services. When your prospective customers see that you offer not only what they generically need, but what they exactly need, get ready for a lot of new leads! Remarketing is extremely effective for boosting your conversion rates and helping your lead generation go even farther. Remarketing shows display ads to the people who have already visited your website as they browse other sites, to remind them that they may still need your services. Businesses who run remarketing generally get a far higher lead creation rate. It is also generally less expensive to show someone a remarketing ad than to find the initial customer on Google. For instance, you might spend $10 to get a customer on Google search, but if they visit your website without becoming a lead, you could spend another $1 through remarketing and retain them as a solid lead. In the end, you spent $11 instead of another $10 to try again with someone completely new, for a total of $20. Use remarketing to maximize the effectiveness of your search campaign, and get more leads to sustain and grow your ROI. 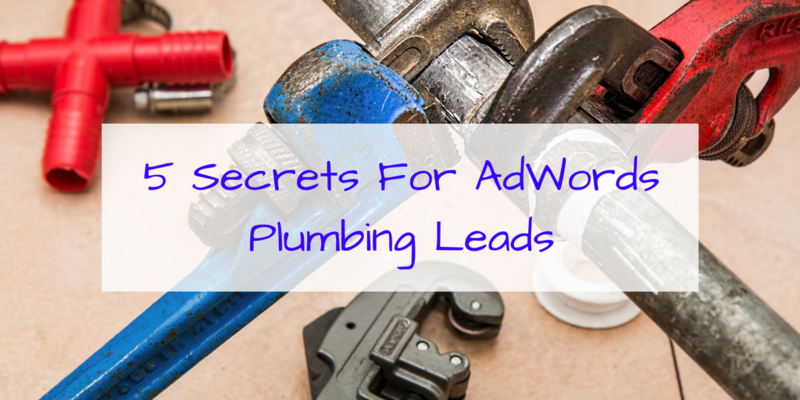 There you go, 5 secrets for using AdWords to generate more plumbing leads! These tips are only the tip of the iceberg – there are dozens more secrets for getting leads and generating more revenue. If you need further assistance, we would be happy to provide our expertise to maximize your advertising success.